It’s so easy to unwrap the little foil packages and throw them in boiling water. Vwah-la, ta-da—veggie broth for soup. The vegetarian bouillon cubes I have in my cupboard at the moment say “natural” right on the label, and “convenience without compromise.” Than means unprocessed, right? Not. The ingredient list on the label includes maltodextrin. We can’t easily produce maltodextrin in our kitchen, so those time-saving broth cubes won’t pass the Kitchen Test. I’ve pledged to go the whole month eating as little processed food as possible, so instead I’m simmering up homemade vegetable broth from an A-list of ingredients. There is nothing like rich, fragrant, delicate homemade broth, and it takes a little more than an hour to make. This recipe is straightforward. You chop up a bunch of veggies, add some seasonings, cover with water, and leave to simmer on the stove for 45 minutes. Strain off the delicious liquid and stash away cold, ready for when you make a hearty soup, like this escarole and white bean soup. 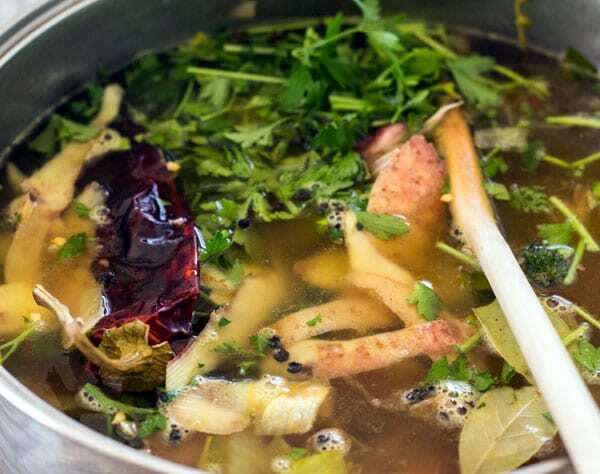 In this recipe the aromatics are browned before adding the water, resulting in a darker broth with more depth of flavor. Alternatively, you can oven-roast the aromatics before combining them with the water and other ingredients. For a lighter broth, just simmer the vegetables without browning first. What’s your go-to soup broth? Does it come from a carton, a can, or concentrated in a jar or little foil-wrapped cubes? Be sure to check the label to keep your October Unprocessed pledge clean. Many store-bought broths, vegetarian and meat-based, contain sugar in one form or another, and ingredients your grandmother wouldn’t recognize. 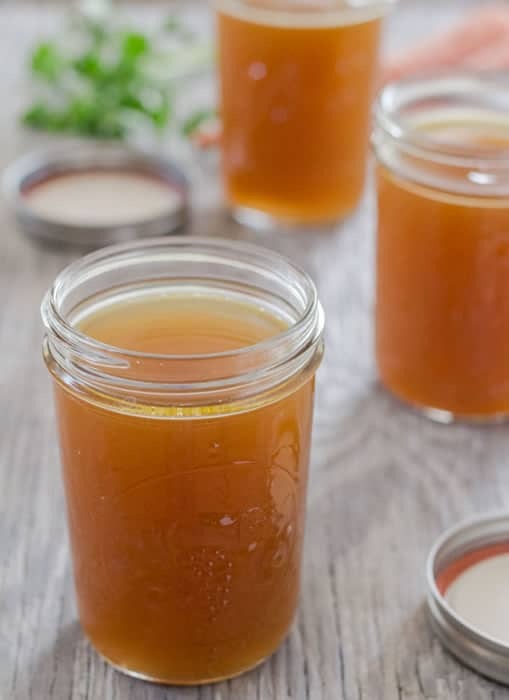 Even if your store-shelf broth is unprocessed, that is, it passes the kitchen test–it’s fun and easy to make your own. Imagine the inviting aroma of simmering broth wafting through your kitchen. I eat mostly plant-based, so I use vegetable broth. If you eat meat you might want to explore bone broths, long-simmered vegetables with beef or chicken bones, well-known for their mineral health-giving value. The liquid from cooking dried beans, spiked with a whole dried chile and a couple of cloves of garlic, yields a super-easy flavorful stock that can be used as a soup base. I recommend using organic vegetables for homemade broth, especially the celery and potato, as both make the Dirty Dozen list of highest pesticides in produce. Read more about the benefits of eating organic here. What’s the difference between vegetable (or meat) stock, broth, and bouillon? All are aromatic liquids made from slowly simmered flavorful ingredients–the words are often used interchangeably and it’s not a big deal. Technically though, stock is unsalted, and a broth is seasoned with salt, and bouillon is the French word for broth. This recipe contains salt, so it’s broth. This recipe is straightforward. You chop up a bunch of veggies, add some seasonings, cover with water, and leave to simmer on the stove for 45 minutes. Heat the oil in a large wide pot over medium-high flame and sauté the leeks, carrots, onions, and celery, stirring frequently, until the vegetables are well browned. Add the remaining ingredients and the water to the pot. Bring to a boil, lower the heat, and simmer, uncovered for about 45 minutes. Line the colander with cheesecloth or a paper towel (or use a fine sieve), and strain a second time. Store the broth in the refrigerator for up to 3 days, or in the freezer for up to 3 months. Save the potato (covered with water) for another purpose, perhaps a soup made with this broth. Mild guajillo chiles add color and unique flavor; one chile in 3 quarts of water contributes no discernible heat. If not using a chile, add another ½ teaspoon black peppercorns. Don’t let the broth sit with the “spent” vegetables—they’ve done their job—strain right away. After years as pastry chef at Deer Valley Resort in Park City Utah, Letty Flatt followed her heart to create Letty’s Kitchen, a vegetarian blog where she shares seasonally inspired recipes, including desserts with a “healthier” twist. Her recipes are often vegan, and sometimes gluten-free. She is addicted to Instagram and is frequently caught posting recipe ideas on Pinterest. Use a soup sock from Sur La Table! Or tie them in a cheesecloth sack and tie a knot. No straining needed! Just remove the soup sock. Voila! I love the cheesecloth sack tip. The straining is the hardest part and with the sack–never again! Thank you! The guajillo chile may not add any heat “discernible” to a chile-eater, but if you are feeding people you don’t know, warn them anyway – if you’re nightshade-intolerant, the chile will make itself known! Good point Sandy–about chiles, potato and nightshade intolerance. Plus other allergens. Thank you! I agree–the freezer is a great place to stash broth ingredients so you have them when you want to make broth. Pacific Foods sells a good “unprocessed” veggie stock in Tetra-pak as well. I’m excited for it to get cooler here and start stocking up on stock! Great recipe Letty! You rock.